I’m blond. What can I say? I made my daughter’s day today. Isn’t that what mothers are supposed to do? Give their children something to laugh about and remember? I had this great new cake recipe I was trying out. It’s a lemonade cake made with Squirt soda and is really good. My friend had made it a few weeks ago. 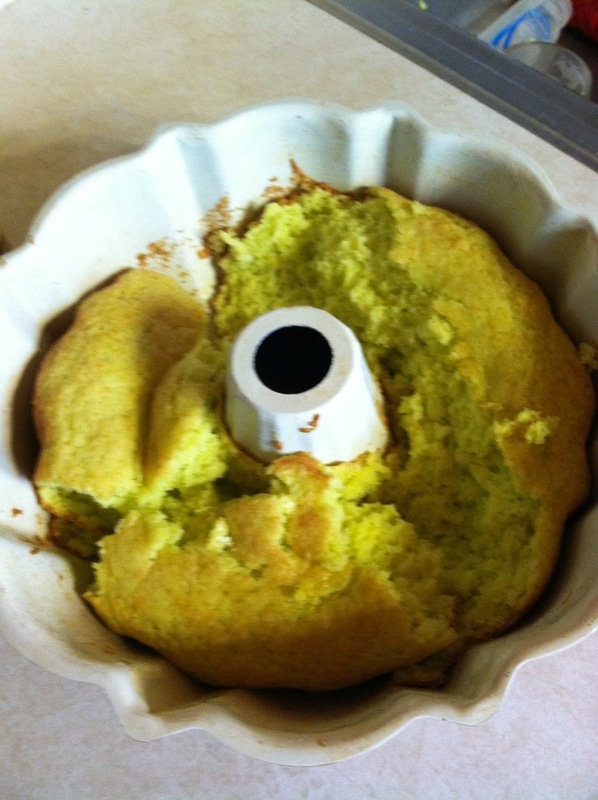 It’s made in a bundt cake pan. The only way I’ve been using my bundt cake pan is to make angel food cake. Keep that in mind. If you’ve ever baked an angel food cake you know you have to invert it onto something while it cools. Well, it was very busy that morning. So I took the pan out of the oven and inverted it, as I always do, not even thinking. I walked out of the kitchen for a few minutes. When I came back, there was the cake in pits and pieces all over the countertop. My daughter was hysterical when I sent her this picture and she posted in on Facebook (with my permission). I laughed too. I picked it up and put it back in the pan. So have a laugh at my expense.